I finished this game today. It was brought in non-working. 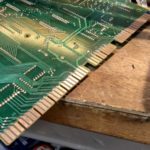 As with all Gottlieb System 1 games, it needed all the power supply and MPU connectors re-pinned with new parts. 8 connectors and 80 pins! That got the game up and running. 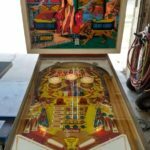 The typical Gottlieb ground mods were also done. That involves adding ground wires directly to the MPU, power supply, and driver board and hooking them together to the common ground wire. This will help prevent over heating of transistors that can cause melted coils. Pretty important when it comes to any Gottlieb solid state game. Here’s the complete run down on what was done to the game. Re-pinned power supply and MPU connectors where necessary. 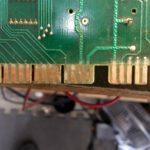 Cleaned all PCB connectors on backside of MPU. Added slam switch bypass jumper to MPU to avoid problem with non-contact slam switches causing the game not to boot. Added free play jumper in cabinet. This adds a credit every time the start button is pushed. Re-seated all driver board connectors and display connectors. Replaced 30 burned out bulbs. Checked all fuses and replaced two that were incorrect values. Replaced pinball with new shiny one. Installed new coin door lock. That about does it. This game is ready for some fun. Turn-around time was next day because all parts were in stock. Amazing! Can’t wait to get old girl home. 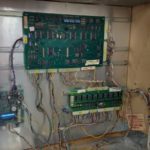 Appreciate your expertise with the old machines!